During the 1979-80 Southern Hemisphere summer, I was privileged to be able to spend four months in Antarctica, working as the Information Officer / Photographer at Scott Base for the New Zealand Department of Scientific and Industrial Research. While I was in Antarctica, I saw and photographed two species of penguins – namely, Adelie penguins and Emperor penguins. There are 17 species of penguins in the world*, and I have set myself a goal of photographing all 17 species. There are two reasons for this: not only are penguins attractive, interesting and amusing birds, but they are also found in wonderful, wild and exotic locations. — and the following picture of all 17 penguin species is a result of a "photostitch" that I made from a series of three photographs taken in the New England aquarium in October 2006. Photographs that I have taken of penguins are included in this website. To see them, simply click on the species in the list above whose names are given in blue type. In all modesty, I regard the photos that I took of Adelie and Emperor penguins in Antarctica as good, and I am proud to show them on this website. Outside Antarctica, I have photographed seven other penguin species: African (or Cape) penguins, Gentoo penguins, Humboldt penguins, Little (or Fairy) penguins, King penguins, Rockhopper penguins, and Yellow-Eyed penguins. However, my photographs of Gentoo and King penguins were taken at the Kelly Tarlton Aquarium in Auckland; my photograph of an African (or Cape) penguin was taken at the New England aquarium in Boston, Massachusetts; and my Humboldt and Rockhopper penguin photos were taken at the Skansen zoo in Stockholm, so they don't really count. I have taken photos of Little (or Fairy) penguins and of Yellow-Eyed penguins in the wild, but most of the Little penguins I've photographed have been while I've been bobbing around on Wellington harbour in my sea-kayak, and the penguins have been little more than blurred dots on the water. The best photo of a Little penguin I've taken from my kayak is included on this website, but it's not a quality photograph and, as a result, it's been supplemented by a picture I took of two Little penguins in the New England aquarium. The first pictures I took of Yellow-Eyed penguins (which were taken in May 2000) were very poor, but I'm delighted to report that while on holiday in the South Island of New Zealand in January 2012, I finally got some decent pictures of Yellow-Eyed penguins, and I am also pleased to say they're now on my website. 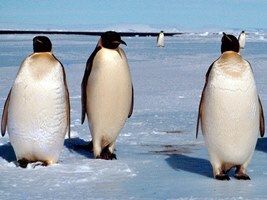 *: There is a good website devoted to penguins — http://www.penguins.cl/index.htm. I highly recommend it to anyone interested in learning more about these amazing and intriguing birds. In addition, two excellent books about penguins are John Love, Penguins (Grantown-on-Spey, Scotland: Colin Baxter Photography, 1997), and Lloyd Spencer Davis, The Plight of the Penguin ( Dunedin, New Zealand: Longacre Press, 2001). Pages in the Penguins section of my website were last revised on 20 December 2012.